A recent bike safety statistics showed that 818 cyclists were killed on U.S. roads in 2015. If you dig deeper into that report, you’ll find that figure represents 2.3% of all traffic fatalities. At the same time, cycling ONLY makes up less than 1% of all trips taken in the U.S.
Further to that, an estimated 45,000 cyclists were reported to be injured on the road. The actual is much higher as we all know that many cases were unreported. Cycling safety has become one of the major concerns on the road in most countries around the world. It’s because there has been a great increase in the number of disastrous road accidents and crashes involving cyclists. There’s a high possibility cyclists could get hit while riding their bikes everyday. The local conditions determine the causes of crashes and it also varies accordingly. It can be caused by speed, weather, rider visibility, brakes, road condition, automobile and bicycle traffic, distracted driving, driving and riding under the influence. Do you think that is the solution? No! You don’t need to stop. 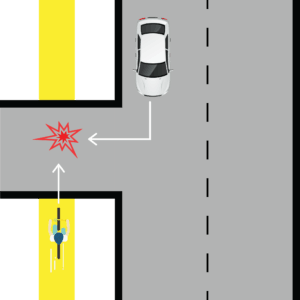 Here are 11 common ways cyclists get hit and how you can avoid it. 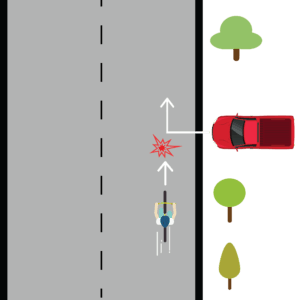 This is a situation where you are riding along the road with the traffic flow, or you innocently ride a little to the left to go around an obstruction such as a parked car and a vehicle runs directly into you from the rear. 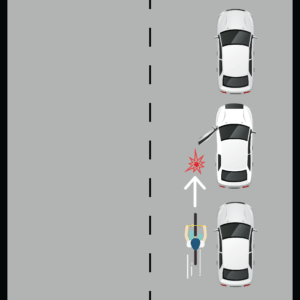 Most cyclists fear this the most when they’re out riding but did you know that this makes up only 3.8% of all cyclist collisions? Lack of visibility. When the driver couldn’t see you in front this situation can occur. The common ones are due to dark clothing, the absence of bright rear bike lights or the sun is shining directly into the driver’s eyes. Lapses in concentration or recklessness by the driver. When the driver is being distracted or when the driver is drunk thereby driving carelessly it can lead to a situation like this. Use tail lights during the day AND night. Set it on blinking as they tend to attract more attention. When the rear light blinks, a vehicle coming from a distance will know something is in front, and the driver would slow down and avoid running into you. A good and value for money tail light is the Cygolite Hotshot 100. Wear high visibility cycling clothing. Don’t wear a dark clothing just because it’s your favorite color. Wear bright cycling clothing or a reflective cycling vest if you’re riding in the dark. Ride on wider roads. Ensure you ride on roads having wide outside lanes that can fit a bike and a vehicle side by side. This gives vehicles enough space to pass you without hitting you. Use a rear mirror. You can see the driver coming behind. Alternatively, you can invest in a tail light that has a built-in radar such as the Garmin Varia Radar. 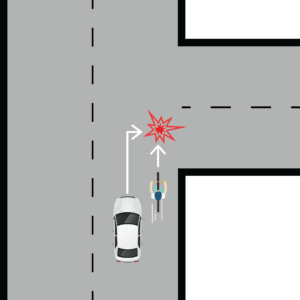 When paired with a Garmin bike computer, it will show you vehicles approaching you as far as 140 metres away. Don’t rely on only rear reflectors. The reflectors should complement and not replace your tail lights. Avoid freeways. You don’t want to have vehicles zooming past you at high speeds. Don’t hug the curbs. While this may sound counter intuitive, riding about 2 feet off the curbs gives you some room to maneuver should a vehicle come too close. 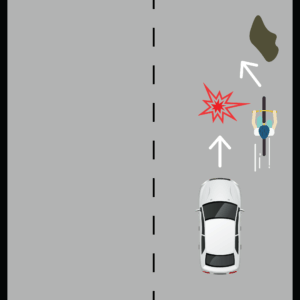 A situation where you decided to change your riding line abruptly due to obstacles in front and the car behind clipped you. Avoiding obstacles. You saw an obstacle in front of you. It can be a parked car, traffic cone, potholes, uneven surfaces, sharps, and much more, and you moved left and outwards to avoid it. This might catch the driver unaware thereby hitting you by accident. Moving out from parking lots. You’re riding along empty parking lots and there is a car parked in front and you need to move left, outwards. Merging lanes. The lane you’re riding in ends and it merges into one. Slow down, look back and left before moving outwards. You shouldn’t be in a hurry to move outwards; there might be a vehicle coming behind and trying to overtake you. Use hand signals. Remember, don’t rely on your tail lights alone. Make use of your hand to signal to the vehicle coming behind you. Make sure you signal for 4-5 seconds before making your move out. Use a rear mirror that you can mount at the end of your handlebars. 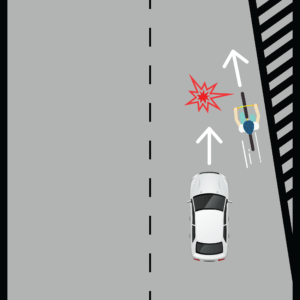 This will ensure you see the oncoming vehicle before moving outwards. Also, you will be able to see if the road is clear for you to change lane or not. Don’t swerve in and out between parking lots. 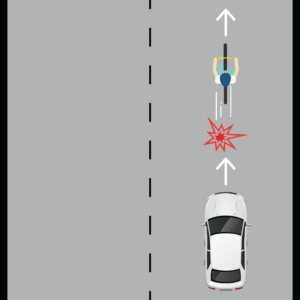 Stay on your current riding lane to avoid having to swerve out again. You never know you might be confusing the vehicles coming behind you. Also, don’t think you own the lane if there are 10 empty parking spots because when the packing lane ends you will need to merge into the traffic and no driver might be expecting this. Avoid sudden movements. Look further ahead and always scan your surroundings to avoid having to react to potholes at the very last minute. 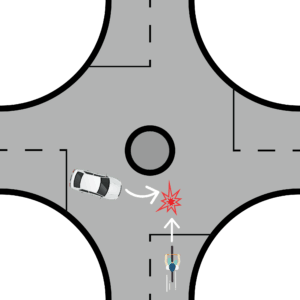 The Right Hook is one of the very common situations where cyclists get hit at intersections. This situation happens when a car makes a right turn in front of you or runs directly into you. The driver might be thinking he would out-speed you because he thinks you are riding a bike and can’t ride faster. Did you that 89% of cyclist killed or severely injured in New York City happened at intersections? And 21% of cycling fatalities happened due to vehicles turning? Misjudged speeds. You’re riding near the curbs and approaching a right turn junction. But you plan to head straight. A vehicle comes up from your back and makes a right turn in front of you. The vehicle misjudged your speed thinking it has enough time to pass you completely before making the right turn. Ride further to your left or the middle of the lane when approaching a right junction if you’re planning to head straight. 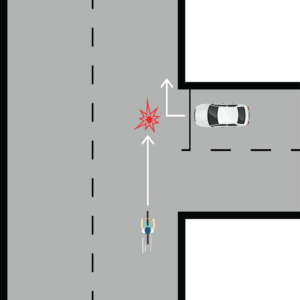 By doing so, you minimise the chance a vehicle would come up from behind and make an abrupt right turn in front of you. Look in the rear mirror. Even if you’re going straight, have a quick look to see if any cars are approaching and if their indicators are turned on. This is a situation where you are riding on the right side next to a slow moving vehicle and then it unexpectedly makes a right turn into you. The driver might be trying to enter the driveway, side street or a parking lot. You’re in their blind spot. The driver can’t see you in their rear mirrors. Driver is not concentrating on the road. The driver is driving slowly as he is on the look out for something by the roadside. Hence he didn’t see you. Keep a distance. Keep a safe distance (eg: 10 feet) behind a slow moving car in built-up areas. Stay alert and be prepared to react in case they make an abrupt right turn. Don’t ride in the driver’s blind spot. The driver can’t see you if you position yourself there. 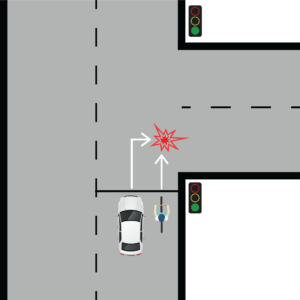 This situation occurs where you stop at the right side of a vehicle that has already stopped at the red lights. Because you stopped on their right-hand side, the driver might not be able to see you. So when the green light comes up, you move forward while the vehicle turns right and into you. You’re not visible. You stopped beside or in the car’s blind spot. When the lights turn green, the vehicle makes an unexpected right turn and into you. The larger the vehicle, the higher the possibility of the driver not seeing you. Lack of patience. You are waiting for the green light to show and so is the vehicle beside you. When the lights turn green, you are in a hurry to move forward trying to outsprint the vehicle. Do you know what direction the vehicle beside you is going? If it’s turning right you are on their right side, it might run into you. Stop in front of the vehicle. Doing so would make you visible to the driver. Ride straight ahead when the lights turn green. Also make sure that there aren’t any vehicles running the red lights. Stop behind the vehicle. Make sure you stop directly behind and not at their blind spot. Doing so would make you visible when the driver checks his rear mirror. Let the vehicle go first when the lights turn green. Let the vehicle go first when the lights turn green. Don’t try to overtake. You can’t tell if it will turn right or not. Check for indicator lights. While you’re stopped, check if the vehicle is indicating where it wants to go. 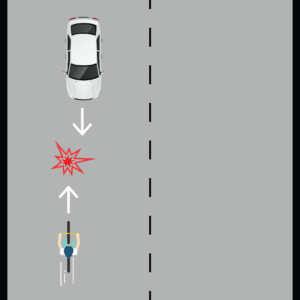 You are cycling on the side of the road or sidewalk against the traffic flow. While this might sound like against our basic common sense, it’s still a common occurrence especially among kids and around built-up areas. Did you know: Riding in the wrong way is 3 times more dangerous? For children, the risk is 7 times greater. The driver does not expect you to ride your bike against the flow of traffic. This put you in a dangerous situation like head on collision crash or side hit crash if the vehicle driver turns without seeing you. Riding against traffic is the most dangerous decision you can make as a cyclist. Even though you might think it is safer because you will see the vehicle coming in front your front, you would be confusing the vehicle driver. He will have less chance to know your speed and distance. Avoid this at all costs. Period. Let’s assume that you’re riding at 15mph against an oncoming car traveling at 40mph. Your relative speed to the car is 55mph (15 + 40) and this gives the driver a much lesser time to react as compared to you riding with the traffic flow (40 – 15 = 25mph). You’re riding in the wrong way. The oncoming car doesn’t expect to see you there and runs into you, head on. Ride with the traffic flow. It’s as simple as that. While you may think that riding against the traffic would make you more visible, it’s actually not. Drivers don’t expect you to be there. Hence, they don’t concentrate on that especially when turning out from the parking lot or driveway. Riding along sidewalks can be dangerous especially if the sidewalk has furniture such as signboards, seating, trees, bins, etc. along it. This furniture actually limits the driver’s visibility, and they might run into you when they’re turning. Some parts of US like San Francisco, Ohio, Columbus, and New York City any cyclist older than 13 are not allowed to ride a bicycle on the sidewalk. But this rule does not apply everywhere like Washington D.C and Boston. Many studies like Wachtel & Lewiston 1994 and Aultman-Hall & Adams 1998 has shown that riding on the sidewalk has a higher risk of crashing compared to riding on the road. If you’ve no choice but to ride on sidewalks, have a bike bell so that you can alert the pedestrians. You’re not visible. The driver didn’t see you riding on the sidewalk, makes a turn a runs into you. Use a headlight to make you visible to the oncoming vehicle. You should be using a headlight even during the day as almost 50% of cycling fatalities in the U.S. occurred during the day. Set it to flash or strobe mode to attract attention. It’d be better if the headlight as side lighting such as the Light and Motion Urban 900. Use a tail light. A tail light would make you visible and alert any drivers approaching the sidewalk and intending to turn into it. Look side and back. Always look to your side and back before crossing between sidewalks between streets. Don’t ride at sidewalks. The best way to prevent this situation from happening is to avoid riding along sidewalks. Riding on sidewalks makes you vulnerable to vehicles pulling out from driveways and you’re also a threat to the pedestrians. In December 2002, Keith Vick died from this situation. This is probably the number one nightmare for most cyclist. 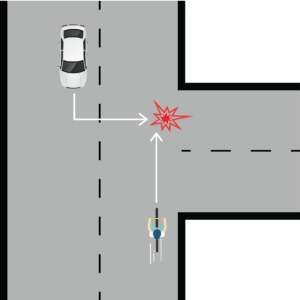 It’s also the third most common bicycle and vehicle collision in Toronto. In the Netherlands, the children are taught about the Dutch Reach a technique to open the vehicle’s door using the hand furthest from the handle. In the U.S., it means opening the driver’s car door with your right hand instead of left. Try it the next time you drive. If you are riding in an area where people park cars at one side of the street, there is a high probability that one of the doors get opened anytime. So you should be careful. The driver opened the car door without looking. This could happen due to several reasons. It can be due to bad habits or pure negligence. Ride further to the left of the vehicle. Leave a gap of 3 feet, or 4 if possible when you’re passing parked vehicles. This ensures that if the driver does open the door unexpectedly in front of you, there is a gap between the door and you. Use a headlight to attract the driver’s attention before the open the door. Your headlight’s beam (set if on flash or strobe) will be seen through their side mirrors. Slow down and look through the rear window of the vehicle to see if anyone is in there. If there is, move a little to the left in case they do open the door. 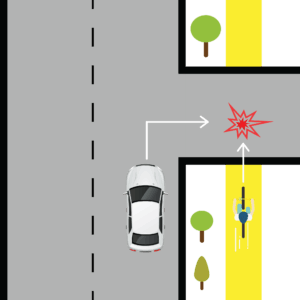 You’re riding straight ahead and a vehicle pulls out from a street, driveway or parking lot on your right. The vehicle could either run into you or miss you by a split second. This is one of the most common ways you can get hit as a cyclist. There could be 2 possible scenario here. The car can hit you while coming out of another street or you can slam into the car if it comes out in front of you. You’re not visible. The driver didn’t see you when they’re pulling out. Use a headlight to attract attention during day time. Set it on flash or strobe mode. If you’re riding in the dark, you MUST use a headlight as mandated by the law. I’d say at least 600 lumens for riding in the dark, or something similar to the Knog PWR Rider headlight. Slow down and look to your right. Whenever you’re approaching a junction, don’t just look ahead. Slow down, look to your right and prepare to stop if there are vehicle coming on your right unexpectedly. Make eye contact with the driver if you can so that they know you’re passing through. In case you can’t make eye contact with the drive, make use of your hand by waving it. Don’t ride too near to the curbs. 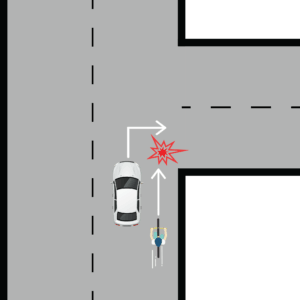 By riding very near to the curbs, you’re indirectly indicating to the car that you intend to turn right when you actually want to ride straight ahead. This is similar to The Right Cross. The only difference is that the vehicle is coming from the opposite direction and makes a left turn into you at the intersection. 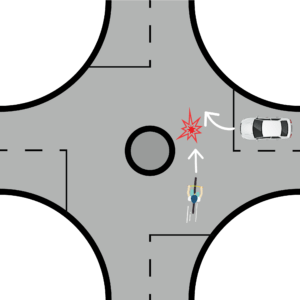 This situation has happened to the former president of the Austin Cycling Association, John Howell and some other Austin Cyclist such as Janne Osborne and Dr. Lee Chilton. You’re not visible. The driver didn’t see you approaching from the opposite side or they underestimated your speed into the intersection. Use a headlight. Make yourself visible, both during the day and night. It’s mandated by the law that you should use road bike headlights at night. Wear visible clothing. Choose clothing that are light in color. Alternatively, wear a reflective cycling jacket over your dark clothing. Slow down and prepare to stop if needed even if you might have the right of way. Don’t ride on sidewalks. Riding on the sidewalks in this situation brings two risks. First, the driver wouldn’t see you clearly. Secondly, if they do see you, they expect you to stop and give way to them because you’re not on the street. Roundabouts are always a tricky and complicated situation especially when determining who has the right of way. The areas in front of the road joining the roundabouts are the danger zone for cyclists. You’re not clearly visible. The driver didn’t see you when they’re entering the roundabout. Misjudged speed. Both you and the driver misjudged your own speeds approaching the roundabout. Each of you thought that you’ll enter the roundabout first. The worst thing that could happen is both of you ended up entering the roundabout at the same time. Use a headlight both during the day and night. 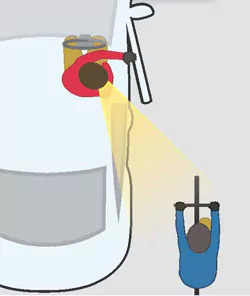 The headlight will attract the attention of the driver on your right and indicate to them you’re in the roundabout and they shouldn’t enter it. Slow down and prepare to stop. It’s a good habit to always do this when approaching a roundabout. Stay away from the edge of the roundabout. Take your lane at the center of the traffic lane. That is where drivers will be paying more attention. Don’t enter the roundabout if there are vehicles on your left. Always look to your left and only enter the roundabout if there are no oncoming vehicles.